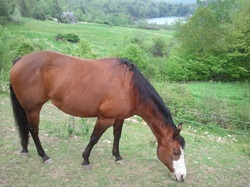 Cool Whiipen Zhip is a registered APHA mare. Her great grandsire is Zippo Pine Bar, who is now in the Quarter Horse Hall of Fame. She is George's special horse and she loves just spending time hanging around with him. Her farm name is Lil' Lady. Lady is a wonderful example of a modern horse and is often used to teach the difference between a standard breed and a landrace breed. Since coming to the sanctuary, Lady thinks she's a pony. Its a riot to watch her kick up her heels Newfoundland Pony style. part-Mammouth donkey, has it going on! Smart, the first thing she did when she stepped off the trailer was make friends with the head mare, Heather. Since then she has shown the other mares she is a donkey who knows her own mind and is comfortable with who she is. If the ponies disagree with that, it doesn't matter to Aries. She is here, she is happy and she lets the whole world know, melodiously, every morning as we approach the barn. Aries is a wonderful guard donkey, ever watchful over her mare friends. Since coming here the coyotes no longer come close to the mare paddock. We admire her chutzpah, but also how sweet she is. She has the prettiest donkey eyes and she knows how to use them to get her way.